Seabird, Seagull & Albatross Tattoo Meanings - There is no shoreline, no ocean breeze, no coastline nor sandy beach which gulls, or seagulls as they are more commonly known, from the Arctic to the Antarctic, and every continent and ocean and sea in between, do not call home. In fact, gulls also inhabit numerous inland lakes and seas around the world. There are some sixty gull species, a number complicated by their tendency to interbreed and produce numerous hybrids. Gulls range in size from 120g (4.2 oz.) to 1.75 kilos (3.8 pounds) and in length form 29 cm (11.5 inches) to 76 cm (30 inches), and wingspans of 60 cm (24 inches) to 172 cm (68 inches). Gulls are most closely related to terns, and distantly related to other seabirds such as auks, skimmers and waders. The albatross is frequently mistaken for a gull, but is an entirely different genus of bird, with twenty-one recognized species, and the albatross is closely related to petrels. The albatross is the largest of the seabirds, the largest reaching sizes of up to 8 kilos ( 17.6 pounds) and wing-spans exceeding 3.4 meters (11 feet) It is also the most long-lived, with birds recorded reaching eighty years of age, although fifty is more common. Unlike gulls which rarely venture far out to sea, the albatross and petrels will fly hundreds of miles offshore, sleeping and feeding and rarely returning to land except to breed and raise their young. In fact, albatross have become such efficient gliders and they are so dependent on ocean air-currents, that powered flight along is difficult for them. At sea, the albatross will drink seawater and has evolved the ability to excrete excess salt from its body. In calm air, the birds will often have to float on the surface until the wind picks up, and take-offs and landings are the most strenuous aspect of flight for the mighty albatross. Albatrosses are noted for their elaborate mating rituals, with males and females bobbing their heads, clacking their bills together, flapping their wings and vocalizing as if choreographed. 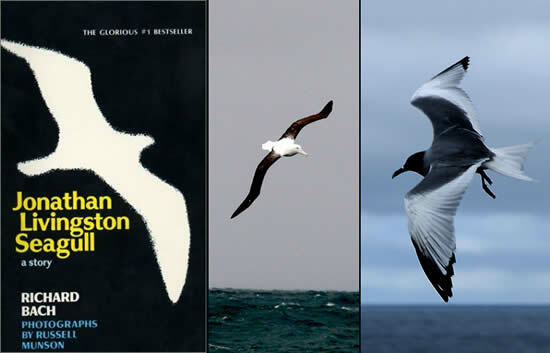 Jonathan Livingston Seagull, Richard Bach's short novel (1970), did more for the gull and seabirds than any previous myth or fable since the Albatross in Samuel Taylor Coleridge's Rhyme (Rime) of the Ancient Mariner, and, in fact, JLS remains one of the most successful acts of literary anthropomorphism in the English canon. Jonathan the gull became a household name amongst the 'personal growth' crowd of the 1970s. Almost overnight, that shrill scavenger became the totem animal for a generation of spiritual seekers. 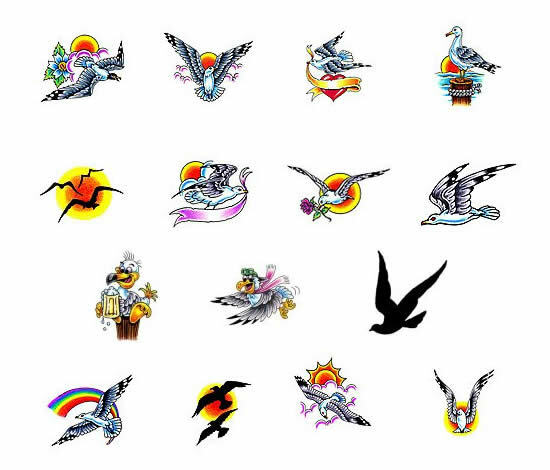 Of course, the personality of that fictional seabird resembled a real seagull not at all, yet anyone considering a seagull tattoo should be aware that to many people, the gull summons up memories of that precocious high flyer. As a gull, Jonathon longed to be all that he could be, and his longing found expression in his pursuit of flight, but not just any kind of flying. Johnathon flew at the boundaries of what was possible and in the end he was transformed, transcending to a new level of existence. In the immortal words of Jim Morrison of the Doors, Jonathon flew until he'd, "Break On Through (To the Other Side). The "Rime of the Ancent Marinere" (original title), written in 1797-1798 by Coleridge, was his longest poem and it ushered in the era of British Romantic literature and was a major influence on generations of writers. The Rhyme of the Ancient Mariner tells the story of a ship's voyage; the ship is driven far off course and is marooned in the Antarctic until an Albatross appears and leads them to safety. But even as the crew praised the Albatross, the Mariner shoots the bird with his cross-bow, an action which arouses the wrath of spirits who pursue the ship, seeking revenge. The Mariner and the ship are cursed for the killing of the Albatross. The ship is becalmed, the crew runs out of provisions, and they force the Mariner to wear the dead albatross around his neck as punishment for his crime. Hence, the modern expression, "an albatross around one's neck", which is a burden some unfortunate person has to carry. In short order the crew begin dying of thirst, one by one, but the Mariner lives on, until eventually the ship encounters a ghostly vessel where Death, a skeleton, and a pale, gaunt woman, "Night-mare Life-in-Death' are playing dice for the souls of the crew. The Mariner's curse is lifted when he sees the creatures of the sea in a new light, not as 'slimy creatures', but as possessing true beauty. The Albatross then falls from his neck, and the dead crew, possessed by good spirits, guides the ship back to land, where it disappears in a whirlpool. As an act of penance, the Mariner must wander the earth and tell his story to those he meets and teach them a lesson. The poem is thought to have been influenced by the voyages of Captain James Cook to Polynesia, and to Coleridge's love of the opium pipe. Some of the passages in the poem have an eerie, truly other-worldly quality. For the rest of us, the seagull is a stout, web-footed and pearl-grey bird, sometimes obnoxious, that populates beaches and harbours and unashamedly begs for scraps, and is not above stealing them. They're plenty smart enough to feed themselves by carrying mussels and clams high in the air and releasing them to drop and smash open on rocks and pavement. The juicy meat inside the mollusc is well worth the trouble. Agile on either water or land, the gull will eat almost anything dead or alive, from marine life to field mice and insects as well. Garbage is gratefully devoured. Among seafarers, the seagull was thought to be the soul of a dead sailor, and for this reason it was never shot (remember what happened to the Ancient Mariner). A gull that settled on a ship's rigging or gunwale was considered an omen for a happy journey. The Maori of New Zealand used the wing-bones of the Albatross in fashioning and constructing their traditional tattooing implements. In Samoa, Tahiti, Hawaii, the Marquesas and other Polynesian tattooing cultures, seabirds were important cultural symbols. The Polynesians revered the ability of seabirds to navigate the open-ocean and made use of them in their own epic voyages. Polynesian navigators used the stars, sizes and shapes of waves, ocean currents, the colour of the water and the presence of seabirds to determine their location on journeys that stretched across hundreds and even thousands of miles of open water. Makemake, the principal God of Rapa Nui (Easter Island), was worshipped in the form of seabirds. Makemake was often represented in rock carvings with a man's body and the head of a seabird. His figure was also carved in wood, and was prominently displayed at feasts, including ceremonies where human sacrifices were made in his honor. Seabirds were powerful totem animals, and there are numerous petroglyphs of stylized seabirds and birdmen. The Easter Islanders believed that they were related to specific seabirds and this formed the basis of a 'bird cult'. One of the 'birdman' rituals was to swim out from the high cliffs of the scared volcano, Ranu Kau to a small rocky out-cropping two kilometers out to sea (1.2 miles) and return with the first egg laid by returning migratory Sooty Tern seabirds. If you're a JLS fan, a gull tattoo will remind you that the journey's destination is no more important than experiencing each moment of life along the way. In the Netherlands, the gull, standing for freedom, is almost a national symbol. The California gull is the official state bird of Utah. There's a monument to it in front of the State Capitol building in Salt Lake City. The gull endeared itself to Mormons in 1848 when a plague of crickets began destroying their crops. After prayers of help, gulls showed up, decimated the cricket horde, and saved the pioneers from potential starvation. Find and buy the perfect seabird design for yourself.